The North and South Fork of Long Island are as festive as ever. The Montauk Lighthouse is decorated in holiday lights, as well as the windmills throughout the Hamlets of the Hamptons. Tree lightings have occurred, libation tastings are being had at some of the wineries and distilleries and local artists, artisans and makers are gleefully putting together their orders for the Holidays or for a Fair. I hope you find this list helpful which is in no specific order and wish you all a wonderful Holiday Season and Happy Shopping! 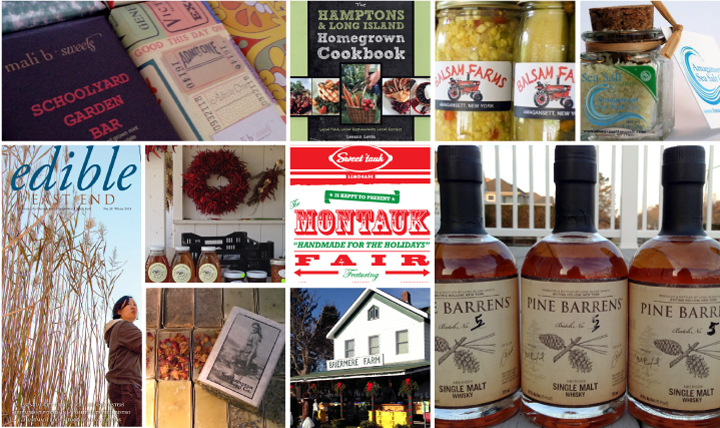 The Hamptons & Long Island Homegrown Cookbook by Leanne Lavin. Featuring Local Food, Local Restaurants and Local Recipes. This book takes the reader on a private tour of outstanding chefs & artisanal growers of the Hamptons & Long Island. I have a copy of this book and is a beautiful addition to my local cookbook collection. Great book for the general cookbook collector or lover of the Hamptons and North Fork food scene. Mali B. Sweets creates the most beautiful and tasty cakes and confections. They are located in the heart of Greenport Village where I happened to walk into their shop when they were busy putting together their holiday orders. Beautiful boxes of chocolate caramels, truffles, dipped orange peel cookies, nuts, chocolates bars, marshmallows and variety brittle filled these boxes from floor to ceiling. It is no surprise how busy they were as everything in this shop visually looks delicious and the flavors and varieties are sensational. Location: 130 Front Street, Greenport, New York 631.477.6762. Open 8am-9pm Daily. Southampton Soaps. We all know you are what you eat but we are as well what we cleanse with! Their soaps are 100% natural using plant-derived ingredients to insure a cleansing experience that is beautiful as well as pure and gentle enough for even the most delicate, sensitive skin. They use local, organic additives whenever possible. If you don’t live locally, you may call them at 631.259.3898 to place an order or visit their etsy shop.